Overnight I have gone from being on my own to having my hubby & 2 boys with me, which is lovely and as expected has added a new, very nice dimension to the holiday . So after feeding the chickens & having a leisurely breakfast we set off on bikes ‘en famille’ to head towards Apt for the Saturday market, promising the boys lunch out whilst we were there. 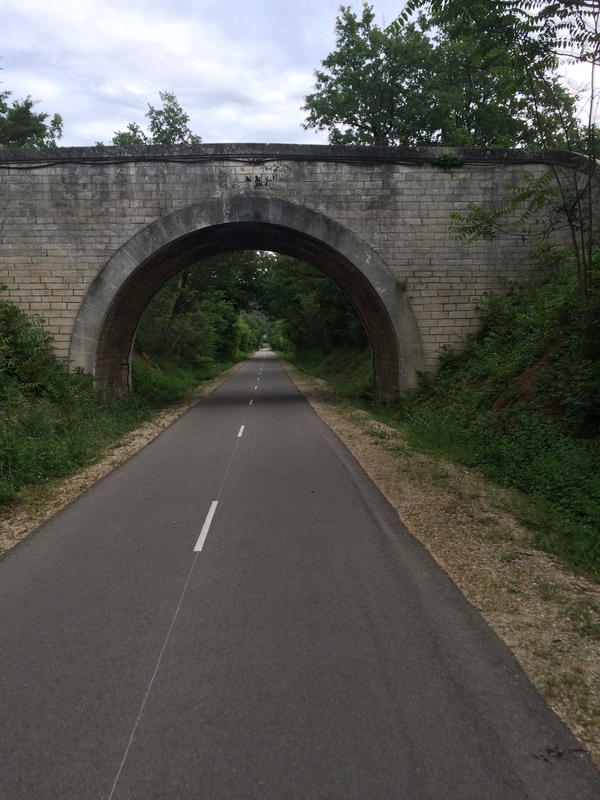 We headed down to the Veloroute du Calavon, which as I’ve mentioned before is so good for easy cycling, particularly with a family, as it is quiet, off road and flat (always a bonus when convincing boys to cycle to a market!). The cycle into the town centre is just under 17 miles and we seemed to get there really easily, passing some fascinating reclamation yards that we must take a look at some other time. We arrived in Apt in plenty of time to have a good look around the market and decide where to have lunch, although plans quickly changed and we ended up buying food for a picnic instead. The good thing about visiting markets with the boys is that they see food they want to try & often we come away with something new. 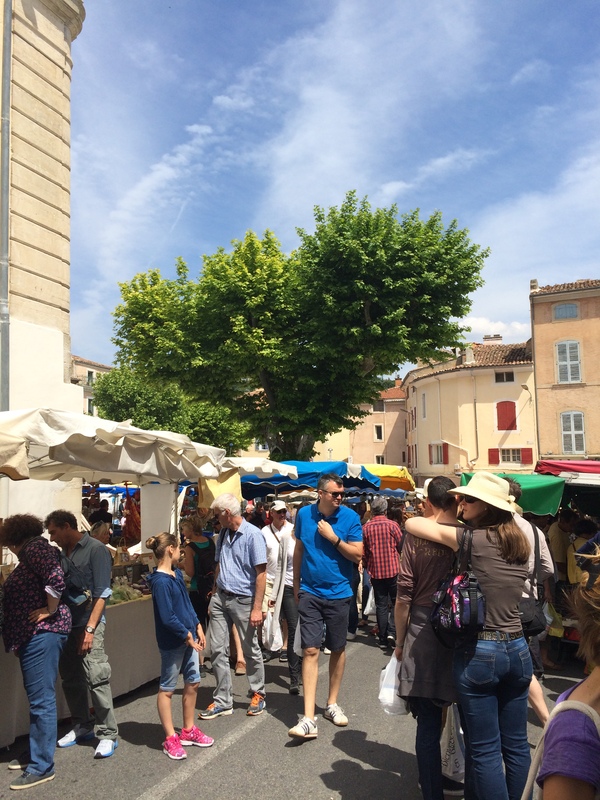 It is also great fun now that my youngest has started practising his French ahead of starting GCSEs next year and he really enjoyed asking for the food at the different stalls we visited. So picnic safely packed into the panniers we cycled back to Pont St Julien for lunch, which included some lovely ‘pain au fromage et noisettes’, ‘fougasse au tomates’, ‘saucisson’ & an incredible cheese dotted with truffles, followed by cherries & strawberries, which are abundant & delicious at this time of year. It was then my husband suggested that instead of going straight back along the cycle path, we should make our way back via Lacoste, which both boys thought was a great idea. 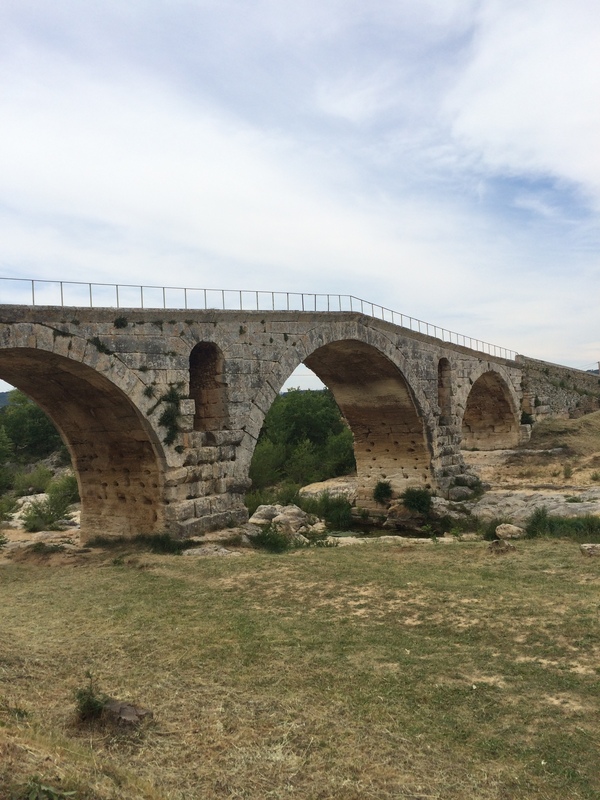 Last year they thought cycling to the top of Mont Ventoux was a good idea (and succeeded in doing it ) so they do have a bit of a history for leaping in with both feet. The route up to Lacoste is a gentle climb through vineyards & lavender fields, which are just starting to show their purple flowers. The views across the valley towards Mont Ventoux are lovely and above all, at this time of year the road is quiet. 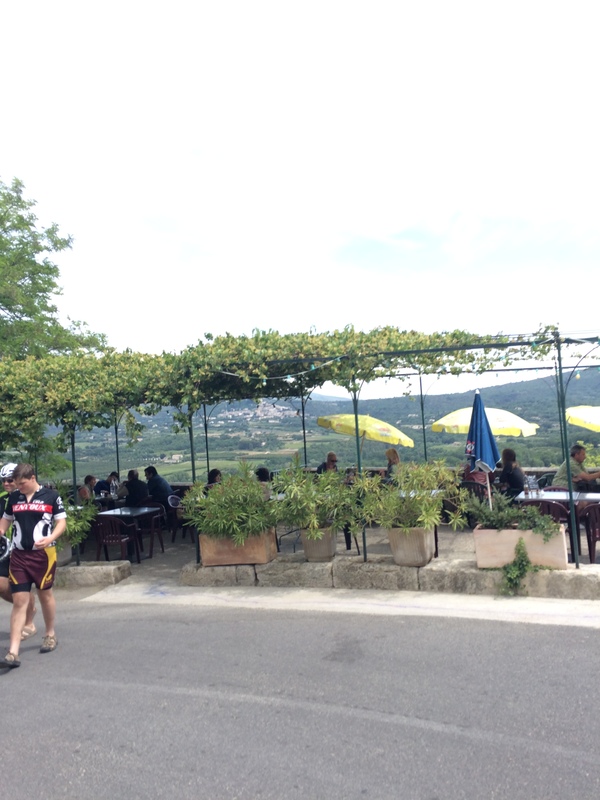 Needless to say the boys are much quicker on the hills than I am (they don’t call me ‘Driving Miss Daisy’ without good reason) and I eventually found them sat on the terrace of the Café de France, looking across towards Bonnieux. 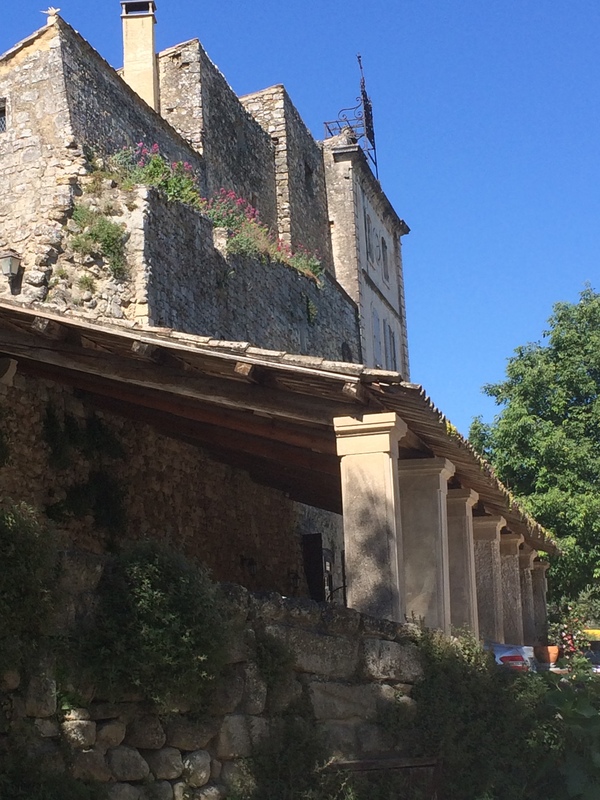 This stop is a favourite of mine as it features in the Ridley Scott film of ‘A Good Year’, one of the things that help to keep me going between visits to the Luberon. After a drink we carried on, cycling along the well-signed ‘Round Luberon Trail’ which took us through Menerbes and finally Oppede-Le Vieux, before finally dropping back to Maubec. I admit that the boys hadn’t been expecting to do quite so much climbing on the way back to the house (I think they would have been happy along the cycle route, without the hills), but they made it up all the hills, without complaint and were surprised to see that by the end of the day we had cycled just under 38 miles, which isn’t bad for their first cycle of the holiday. I have really enjoyed my cycling over the last week, but it is so nice being able to cycle as a family around the area and I expect we will be doing more rides, exploring a bit more of the area over the next few days. 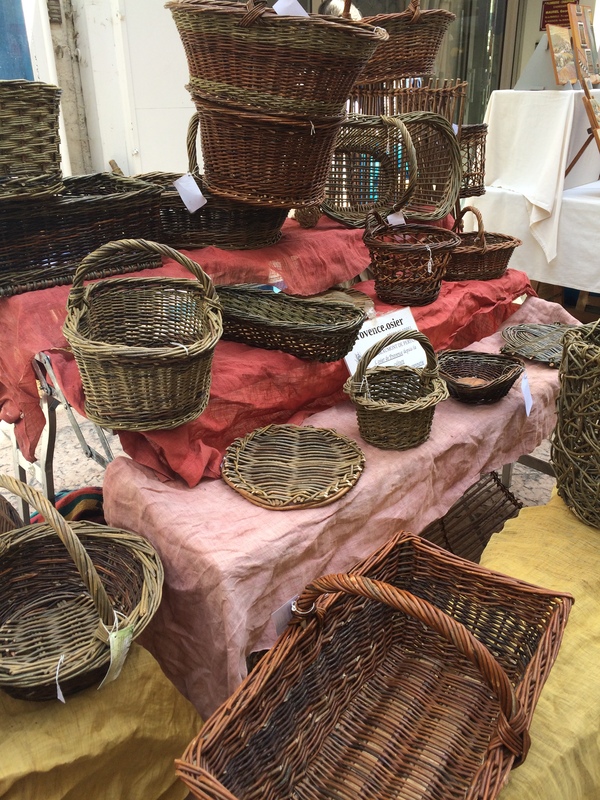 However tomorrow is L’Isle Sur La Sorgue market & an extended Brocante fair to coincide with the Pentecost weekend events here in France, so I think we will be heading there ….. perhaps I’ll wait till the morning to tell the boys! !